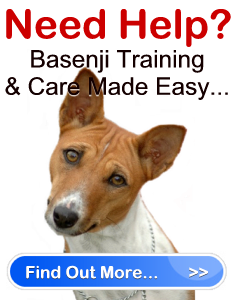 Basenji Puppy Training & Care " "
A Basenji puppy is highly energetic and playful. It comes from a delightful breed originating in Africa. It is very affectionate and makes a great pet. If trained at an early age, it will be well-behaved as it grows. It is important to expose the puppy to people as much as possible because it can be shy and suspicious around strangers, although it can be very sociable with children. A Basenji’s coat usually comes in black, copper, red, or in a combination of three colors such as black, tan, and white. As the puppy grows, it will have longer, straighter, and more erect ears that open in the front. &nbsp;A Basenji puppy can grow between 15 to 17 inches tall and can weigh between 22 to 26 pounds, depending on gender. Life expectancy: The Basenji usually have long lives that can span from 10-12 years. Health risks: They are prone to Fanconi’s syndrome. If the puppy has signs or symptoms of the syndrome, immediately visit a veterinarian. They are also susceptible to retinal atrophy, eye, and intestinal problems. They are also at risk to hypothryroidism and hip dysplasia. Exercise: Because Basenji puppies are highly active, daily exercise is needed–a long, daily walk is recommended. Living: Can do well in a small apartment as long as they have enough exercise and go outdoors regularly. It is recommended to keep with two to three fellow Basenjis. Can be hostile to non-dog pets. Grooming: Sheds little to no hair, and have no dog smell. Washes themselves like cats. Recommended for people with allergies. Litter size: A Basenji mother can have 4-6 puppies at a time. Other tips for owners: The Basenji are also an independent breed. It is important to display authority well and show them who is boss. Even as puppies, the Basenji are clever and charming, especially at getting their own way, so owners must be careful and smart. They are also territorial, so again, they must be exposed to other people as much as possible. A Basenji puppy must have enough obedience training, and owners should use a variety of training techniques because Basenji puppies tend to get bored easily. It is also recommended to give them lots of toys to chew on, since they have lots of energy.